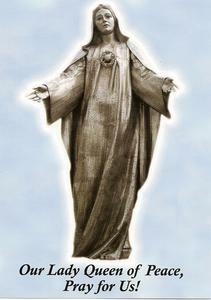 The statue of Our Lady, Queen of Peace, was dedicated by Bishop Michael Saltarelli, on Saturday, May 26, 2007. It stands alongside Holy Spirit Church and is visible to all who travel over the Delaware Memorial Bridge and Interstate 295. Visit our website at http://www.ourlady-de.org/. Miraculous Medal Novena is held every Thursday evening at 7:00 PM in the Chapel. All are welcome to attend. The Benincasa Monastery Gallery & Gift Shop is located on the grounds of Holy Spirit Catholic Church. Call (302) 654-1206, or (302) 689-6420, for more information or the times the shop is open.